Enhance your accuracy with a reactive falling plate target system that provides immediate visual and audible feedback for any centerfire handgun caliber. The PT Plate Rack is the perfect system for honing your handgun accuracy. With six 8ï¿½ target plates made of through hardened AR500 armor steel, you get instant positive reinforcement for accurate shots from both the clanging of the steel and the falling of the target plate. The PT Plate Rack lets you train like a professional without ever interrupting your concentration by having to go downrange to reset. After all six of the targets plates have been knocked backward, all it takes is a simple pull of the 30ï¿½ steel cable, and you are ready to go again. The target plates of the PT Plate Rack are manufactured with a no-weld design to prevent breakage and are easily reversed without the use of any tools to extend the life of your target. Simply remove the locking bar that runs the length of the PT Plate Rack to rotate, or replace the target plates. Because the 30ï¿½ reset cable provides you with instant target resetting, increasing your accuracy or challenging friends to a competition has never been more convenient and easy. And if youï¿½re really serious about competition, you can train with confidence knowing the PT Plate Rack complies with Bianchi and USPSA standards. 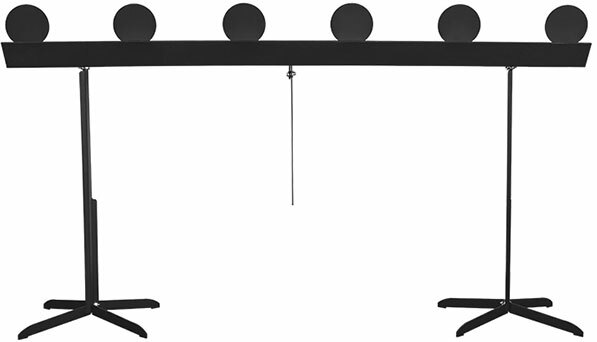 *The PT Plate Rack is designed for use with centerfire handgun ammunition only. Using rifle ammunition may result in the malfunction of the targetï¿½s reactive features and/or damage to the target.